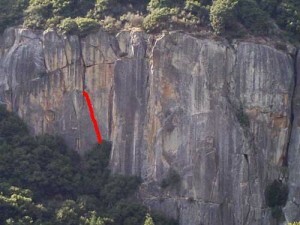 This is perhaps the most classic fingertip crack in Yosemite. Tiny edging and technical moves lead to a stance for placing the first piece of protection?a scary 15 feet above the ground. Delicate stemming between fingertip liebacks past thin, hard to place protection constitutes the next 15-20 feet of the route. Higher, the crack appears easy but packs several tricky cruxes to an easy final section of hands and liebacking. Which SuperTopo guidebooks include a topo for Crack-a-go-go?